A new report says the upcoming 2013-2014 season will be Jay Leno’s last behind the desk of The Tonight Show before he’s replaced by Jimmy Fallon. Jimmy Fallon, who now hosts NBC’s Late Show, will be officially announced as the new host sometime in the summer of next year. The Hollywood Reporter cited two anonymous “high-level industry sources” who say the network wants to bring in Jimmy Fallon in response to Jimmy Kimmel’s show moving to the 11:35 time slot in January. 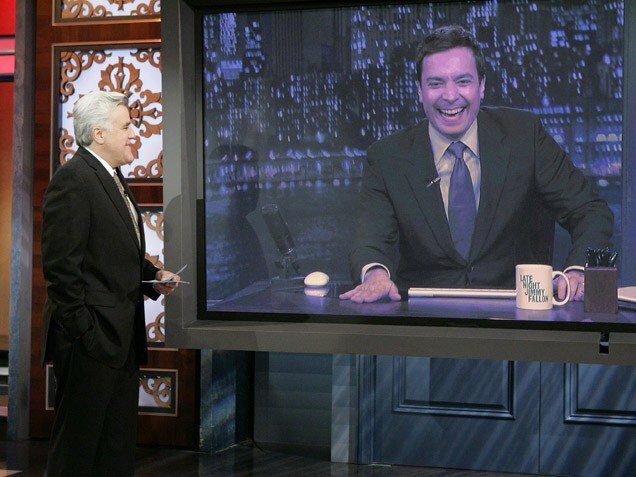 “The more time Jimmy Kimmel is in that slot, the more the young audience goes that way, the harder it is for [Fallon] to keep that audience,” one source said. Jay Leno has kept his spot on top of the late-night ratings, but Jimmy Kimmel is competitive in the coveted 18-49 demographic. “Kimmel has done extremely well,” said one unnamed network veteran. NBC denied the story, while Jay Leno’s reps said “we do not speculate on rumor”. The Hollywood Reporter noted that Jay Leno would likely be reluctant to leave, especially if he were forced to retire while longtime rival David Letterman remains on the air. The two famously battled to follow Johnny Carson’s legendary tenure as host of the Tonight Show, with Jay Leno eventually winning the spot while David Letterman left NBC for CBS to start his own 11:35 show. Their fight over the show was the basis for the non-fiction book, The Late Shift, which was adapted into a film of the same name by HBO in 1996. Both hosts are signed through 2014. It’s also possible NBC is worried that if David Letterman does leave next year, CBS would be looking for a replacement host, potentially leading to a battle over Jimmy Fallon. Late night comedy brawled over talent in 2010 when Jay Leno left the Tonight Show to host another show at 10. Six years prior, then NBC-head Jeff Zucker had promised then-Late Night host Conan O’Brien that he would get the Tonight Show as part of a deal to re-sign with the network. But the strategy was a disaster. Jay Leno’s 10 p.m. show tanked in the ratings and Conan O’Brien’s Tonight Show struggled out of the gate against David Letterman. A year later Jay Leno was back, and NBC had gone through a costly and embarrassing debacle. Conan O’Brien left the network and now hosts a show on TBS. The network would also save money paying a far lower salary to Jimmy Fallon compared to the roughly $20 million per year Jay Leno makes. If NBC does go through with ousting Jay Leno, one observer notes they will “get the benefit of selling Jay’s last year – again”.